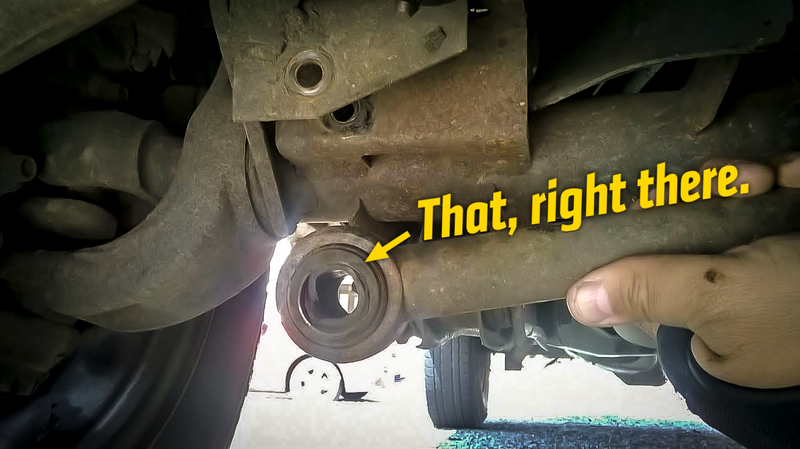 If you've ever driven down a straight road and felt a huge dead spot in the response of your steering wheel, or have had to correct constantly to do something as simple drive in a straight line, you may need new front suspension bushings. Fortunately, I'll tell you how to replace them quickly, using nothing but regular hand tools. The bushings in a car's suspension are, in essence, rubber mounts that dampen vibrations and keep the car from handling erratically. These rubber mounts degrade over time, and can contribute to a loose-feeling when steering, possibly exhibiting an audible clunk over bumps. A great upgrade to original rubber mounts are stiffer polyurethane bushings. They're often cheaper than the original rubber units, since they don't require a specially-made outer metal sleeve like the rubber ones do, and they're much more resistant to the elements and any other caustic chemicals and fluids that may make it to your car's undercarriage over time. The polyurethane bushings are usually arranged in two halves, with a metal sleeve to house the original bolt, as shown. Although the procedure of removal of various suspension components may vary, the removal and installation of the bushing in most cases will be identical to what's shown here. The following method was performed on a Jeep Cherokee Sport XJ. 1. Remove the bolt holding the suspension component with the worn bushing inside. 2. Place a hacksaw blade in the bushing's hole, facing outward. 3. Assemble hacksaw around blade still inside the bushing hole. 4. Cut two grooves into the bushing and metal sleeve. Do NOT cut into the suspension component itself. 5. When both grooves are cut, use the pry bar or screwdriver to pry away the section that was just cut. This relieves pressure and allows the bushing to come out. If it's rusted on, use WD-40 or PB Blaster and use a hammer with a socket roughly the same size as the hole to push the bushing out of the other side. 6. Clean suspension component, in preparation for new bushing. 7. Offer up one half of the new bushing to the suspension component, grease it up, and use the C-clamp to push it into its place. 8. Do the same for the other side of the bushing. 10. Put bolts through and tighten, assemble rest of suspension components. 11. Drive and enjoy a car with sorted (and upgraded) suspension bushings! Keep in mind, sometimes when changing bushings, you have the possibility of changing alignment specs, so make sure that you mark off any adjustable camber/caster/toe bolts before you begin, to return them to the exact spot when you finish. Even so, an alignment may be necessary, as the new bushings may change the orientation of components ever so slightly, depending on the type of bushing you're replacing. Also, sometimes retaining the metal outer sleeve is necessary. If this is the case, use the hacksaw to cut away at the rubber material until only the metal sleeve remains. Burning it with a propane torch also works, but this can produce potent noxious odors, so wear the appropriate eye and mouth protection if attempting this. You can also follow him on Twitter and Facebook. He won't mind.